As I said in my review of Sourdough, I absolutely adored Robin Sloan’s debut work, Mr. Penumbra’s 24-hour Bookstore. Since Sourdough didn’t necessarily sate my appetite, I found Ajax Penumbra 1969 to be a light snack that brought me back into the world created by Sloan. Acting as a bit of a short story/novella prequel to the first book, Ajax Penumbra 1969 still maintains the themes common in Sloan’s work: mainly, the combination and juxtaposition of analog and digital technology. In this case, the reader just happens to come across this dichotomy in 1969. Following the titular character from the first book, Ajax Penumbra 1969 gives the origins of this mysterious character as he searches for answers and eventually ends up in San Francisco at a little 24-hour bookstore. The following mystery and intrigue are what I would expect from such a story, but the inclusion of the budding technological aspects of the late 1960’s helped to show that not only was this character finding his way to an eventual life filled with books, but technology’s infancy already had much potential at this early stage of development. It’s a little difficult to say much about this short story/novella since it didn’t even take a full two hours to listen to. At any rate, it’s a fun little side story for those who had picked up Sloan’s first work and fell in love with the ideas and characters presented therein. 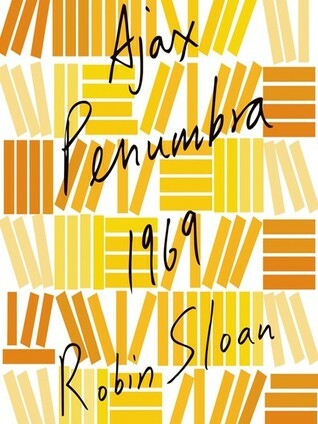 While not necessarily a book that most people would pick up and read without having already read Mr. Penumbra’s 24-hour Bookstore, Ajax Penumbra 1969 is required reading for anyone like myself who has become enamored with Sloan’s writing style over the last few years. A fitting prequel to the events of Mr. Penumbra’s 24-hour Bookstore, I give Ajax Penumbra 1969 4.0 stars out of 5.